This is the start of my Bangkok to Ao Nang blog detailing a 6-days 5-nights trip from Bangkok to Krabi province, including a day trip to the world famous Phi Phi Island. After flying for 9 hours I arrived in Bangkok at around 4:30pm. Being nearly first off the plane and striding down the moving walkways of Concourse C I headed to the Bangkok Airport immigration area. People who travel First Class will be taken in the little electric buggy, but very rarely can they beat me, as they get held up behind the groups of Indians and Chinese meandering to their next plane, or else they are trapped behind the smokers spilling from the smoking room. One thing about Suvarnabhumi Airport is that it does not have the wide aisles like in Changi Airport. The brisk walk down Concourse C gets the blood surging through my legs and clears out any clots that may have started to accumulate from the hours of immobility on the airplane. When questioned about deep vein thrombosis or economy class syndrome as it is more commonly known, my Doctor told me, "if you haven't had a clot by now, then you are not going to get one." With that I felt much reassured but never went back to that Doctor again. After passing through the Bangkok Immigration hall and getting my passport stamped, I exited the airport and took an AOT limousine car to the Dusit Princess Hotel. 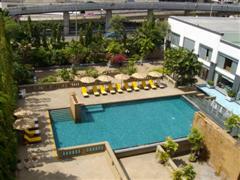 This is a popular choice with flight crews as it is located just about 20 minutes from Bangkok airport. The cost was 800 Baht to travel in a Toyota Camry driven by a professional driver (or at least I like to think he was professional). 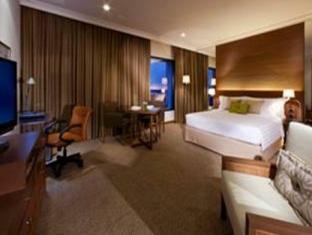 Upon arrival at the hotel and completion of the check-in formalities, the porter escorted me to my room. After the porter had backed out of the door, with his tip in hand, there was no time to waste. So I took a quick shower and then proceeded next door to the Seacon Square shopping mall for a bit of shopping and a Thai massage to get me relaxed after my flight to Bangkok. I also needed to purchase a power adapter for my electric razor and so walked all the way through the ground floor of the shopping mall until I reached Tesco Lotus at the far end. Tesco Lotus is a large department store and is set out on two levels with general groceries and fresh food on the ground level and clothes and electrical items on the upper level. It was not difficult to find the spot where the electrical adapters were located. They were price marked at 50 Baht, so I got two and went towards the cash registers via the men's clothes section. Here I picked up three casual shirts for about 240 Baht each. The quality in Tesco Lotus is generally very good for clothes, although items are a bit more expensive than in the Bangkok street markets or the stalls in the MBK Shopping Centre. I paid for my items at the checkout and walked quickly to the centre of the shopping mall near to McDonald's and went down the escalator to the lower level of Seacon Square. I was looking for a good massage shop for my two hour Thai massage and I knew from previous visits there was a good choice on that level. There are a range of Bangkok massage shops on the lower ground floor, so it is just a case of seeing which one takes your fancy. 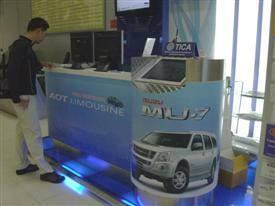 The lower ground floor is also the place to go for mobile phones, computer equipment and everything health and beauty. I chose one of the massage shops and booked a two hour Thai massage and was immediately welcomed in. If you have never had a traditional Thai massage then it follows a similar pattern no matter where you go, although there are subtle variations, depending on where the massage lady did her training. So before knew it the two hours had gone and I had my cup of ginger tea that usually follows a Thai massage. Feeling very relaxed, but more tired than I expected, I walked back to the hotel for an early night, in anticipation of my Bangkok to Ao Nang journey the following day. Although Ao Nang is only about a one hour flight from Bangkok, the door to door travel time is probably closer to 4 hours, with a lot of waiting in between. The next morning I went for the buffet breakfast that was included in the room rate, ate my fill and then had a couple of hours relaxing by the pool under the hazy Bangkok sunshine. The swimming pool at the Dusit Princess Hotel rarely has anyone in the water and you will not have to fight over the sunbeds, just take your pick. If you do have an onward flight to Phuket, Krabi or Koh Samui then I can recommend this hotel. As part of the Dusit chain of Thai hotels they have a distinct Thai feel to them and are sure to make your stay comfortable. 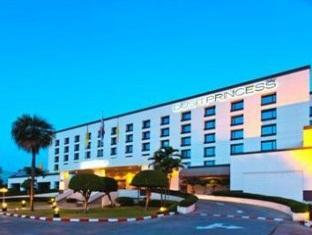 Welcome to the recently refurbished Dusit Princess Srinakarin Hotel, located just 20 minutes from Suvarnabhumi Airport. If you have a Bangkok layover from Ao Nang, Phuket or Koh Samui, the Dusit Princess is an ideal choice before heading off on the next leg of your journey. From USD $121 BOOK NOW! If you are not familiar with the geography of Thailand; the nearest airport to Ao Nang is at Krabi. The flight to Krabi was scheduled for 1:50pm so I was planning to check out at 11.30am to arrive at the airport two hours before the flight, as I always like to leave plenty of time. There was nothing to pay on my checkout from the hotel as I had booked the hotel through Agoda travel and everything was pre-paid and I didn't take anything from the mini bar. The concierge called me a taxi, by going out into the road and hailing one. The hotel limousine was an option for 900 Baht but I don't have a problem taking taxis to the airport, especially when they are selected at random off the road. I very rarely take a taxi when leaving the airport though, as it can sometimes be a problem, not only for tourists visiting Bangkok, but also for Thais. To me it is not worth the headache that it can cause. The Dusit Princess Hotel is only 20 minutes from Bangkok Airport and there was very little traffic on the expressway, so we were there in no time at all. I gave the taxi driver 200 Baht including his tip and went to the Thai Airways check-in counter to meet up with my friends. Even though I had purchased economy tickets my Royal Orchid Plus Platinum card let me use the Business Class queue and after a few minutes wait my bag was checked and we proceeded to go through the security check to the Royal Orchid lounge for a spot of lunch. The Thai Airways domestic lounge is located in Concourse A and this is also where the Bangkok Airways lounge is. 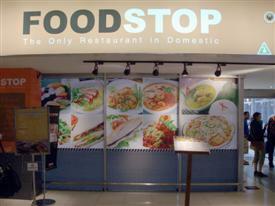 Before you get to these two lounges you can go and eat at Food Stop. In here they have Auntie Anne's, Burger King, Dunkin' Donuts, The Coffee Club and Thai and International Food so if you are not visiting one of the two airline lounges then you should find something to eat here. There is certainly a fair selection at reasonable prices. Once you enter the Thai Airways lounge you can walk all the way through to a large open area at the back. This where there are bound to be plenty of seats available with food and drinks nearby. Most people probably don't even realise this large space is available, but it is the place to go as it is light and airy with plenty of space and it is usually fairly quiet. Actually there was plenty of time for a snack and drink before it was about time to go to the departure gate and board the plane bound for Krabi Airport, which is as I have said is the closest airport to Ao Nang. From the departure gate we had to take a bus to the airplane. In fact the bus drove so far across the tarmac I thought we were driving to Ao Nang itself. We boarded the plane at the rear and took our seats and soon we were off leaving Bangkok behind us. 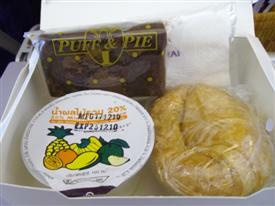 The flight to Krabi is only one hour and the Thai Airways staff did serve a small snack on the plane, but before long the plane was touching down at Krabi Airport. I didn't get much chance to take pictures out of the window as I was in an aisle seat. After the plane touched down in Krabi airport, there was a short wait for the bags to arrive. It would have been easier to take the baggage as carry-on luggage, as it was only small and not that heavy. I made a mental note of this for the next trip to save some time. 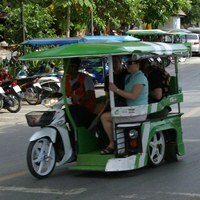 Now we were nearing the final part of my Bangkok to Ao Nang journey and where the holiday was to begin.